Ok, this may be my favourite model in the new faction! I love the art for her, the model looks great and I’m very happy with how her rules turned out. 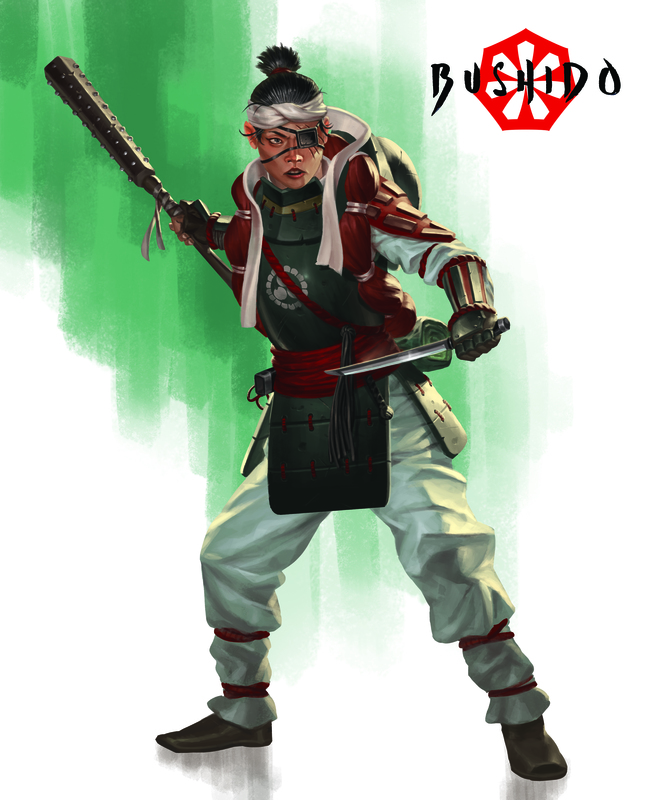 Aya is from the Masaema family which was raised to minor clan status by the Minimoto and so some of the family are now Samurai. 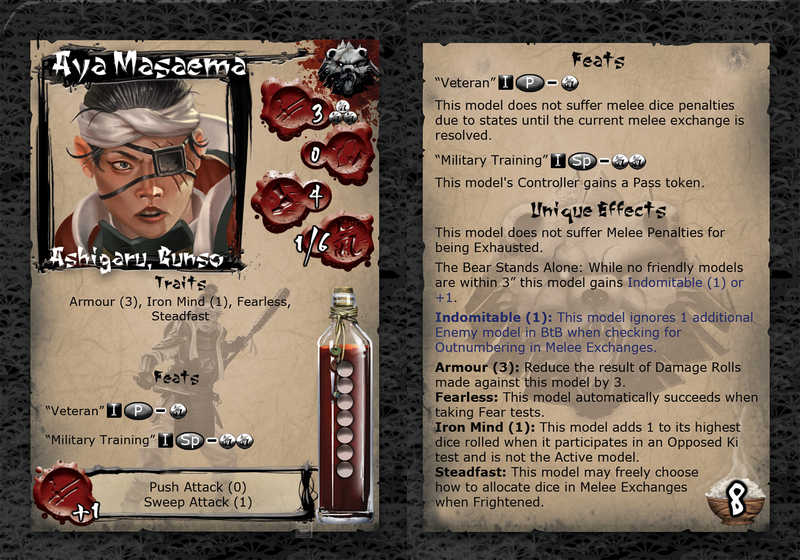 Most are still faithful Ashigaru however and Aya is one of the foremost of these as a Gunso in the Bear Clan army. She has been in the thick of fighting since she joined up in her teens and has seen everything battle in the Jwar Isles can throw at her. This experience is the core of her character and on the table she is all about reliability. Aya has Armour (3) and Iron Mind which is a solid defensive base, as you’d expect from the Bear Clan with the characteristic 7 wound boxes of the faction. Fearless is usually only on a faction’s top characters but in this case Aya is the one who knows holding your ground and fighting through to the end is the best way to survive and win. To synergise with this core of reliability the awesome new Ki Feat “Veteran” allows Aya to keep her three dice even when afflicted with any amount of state effects. She’s seen it all before and can calmly fight through being knocked prone, blinded or stunned. This is an amazing feat and to round off this ability to ignore negative melee penalties, Aya does not suffer penalties for being exhausted! This suite of abilities with the ubiquitous The Bear Stands Alone makes Aya a great model you know is going to do her job regardless of what your opponent throws at her. To reinforce her theme of a reliable veteran soldier she has Military Training which is not a theme in Minimoto as it is in Prefecture of Ryu but its an option that sometimes becomes invaluable. Like Touga, Aya is a starter box model so has all her Traits detailed on the back of her card. You can see the Bear Clan’s Gunsos are different to the Prefecture’s (Who are there to lead other Ashigaru by issuing commands) and the Ito’s (The Ito simply promote the best individual soldiers rather than those with leadership abilities), in the Bear Clan Gunsos lead by example. Aya will always be in the thick of the action and expects her ashigaru to do the same. We would love to know what you think about Aya over no the forums. 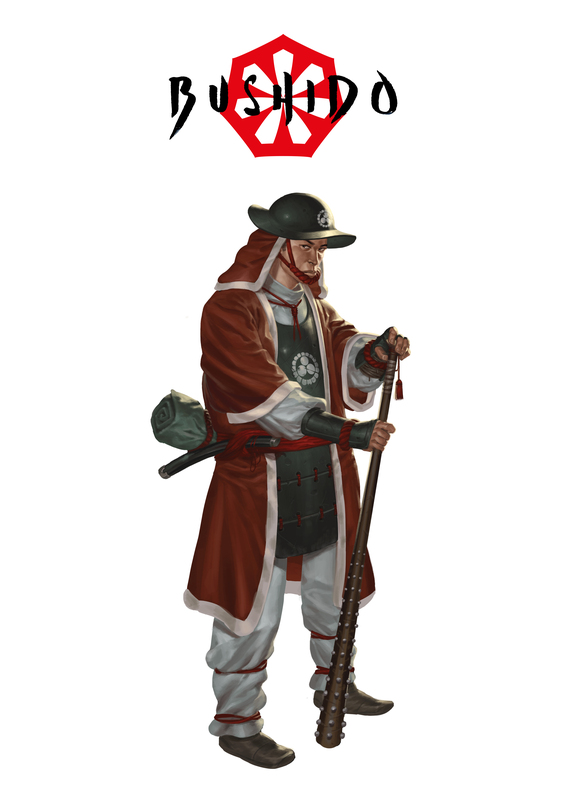 Yoshinobu is an established Ashigaru, not a long-serving professional like Aya, he has seen his share of combat and is more adaptable than most Ashigaru. All Jyoto Ashigaru are heavily armoured, each suit individually tailored to the particular soldier.They carry heavy metal Tetsubo which most men need two hands to use (Though some of the Minimoto effortlessly swing them with one hand or indeed, wield two of them!) with which they are trained relentlessly to build up their strength. Notice the Armour (3), all Jyoto Ashigaru have this heavy armour and have Melee Strength modifier. 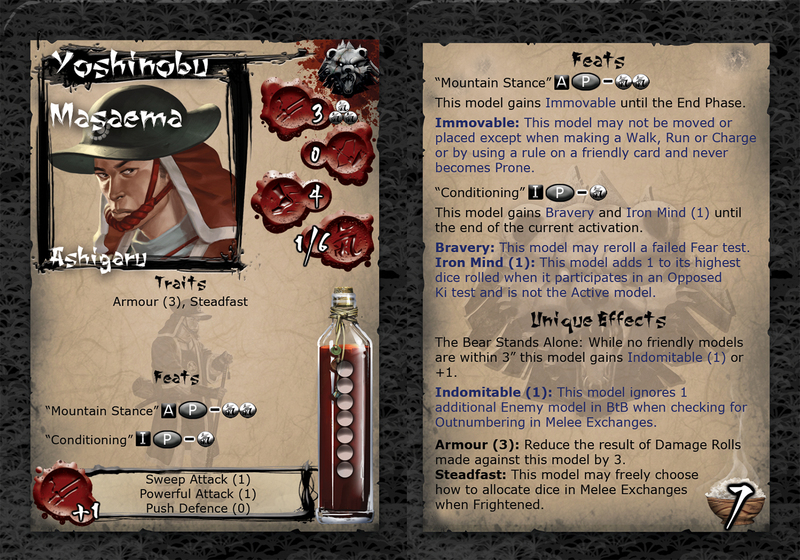 Yoshinobu has learned the basic Ashigaru technique of centring his mind to ignore terrifying enemies or the magics that may try to affect him but has developed his own technique for holding strong against the enemy. Immovable is a powerful ability and very suited to Minimoto Clan models. He also has a wider range of Special Abilities than most Ashigaru, learning the benefits of merely fending off a foe but also knowing how to make a finishing blow.